Dr Payman Simoni has perfected the Simoni Face liftwhich has revolutionized and outdated traditional facelift procedures. Dr. Simoni’s Super Glue Face Lift has gain a huge rise in popularity among both men and women in Los Angeles and has taken Hollywood by storm.The Super Glue Face Lift is without risk of going under anesthesia and hasonly 72 hours of down time,these low risk and minimal down time benefits has made this almost seamlessly painless procedurethe top choice facelift among celebrities and jet setters. From Beverly Hills, Dr. Payman Simoni, adoubleboard certified Facial Plastic Surgeon by the American Board of Facial Plastic and Reconstructive Surgery and the American Board of Head and Neck Surgery is the genius behind this concept. Simoni has been doing this revolutionary lift while the patient is sitting upright and wide-awake. 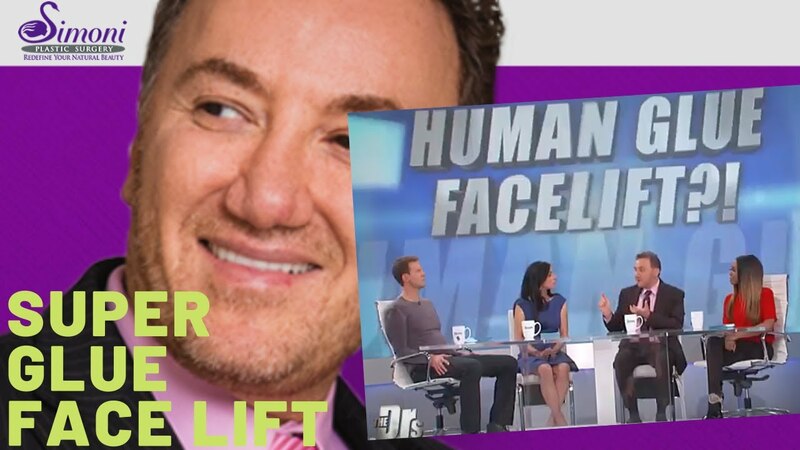 Dr. Simoni has revolutionized facelifts by utilizing "human glue" in his facelifts. The glue is made from the protein in human plasma and is sprayed under the skin. It is like crazy glue and glues the entire face in 3 minutes which in normal traditional facelift would take about 3 weeks. Since the skin attaches immediately, there is no need for any painful drains or even theheavy wrapping of the face which are the common parts of any face lift. As a result of this method the healing process is way faster with minimal bruising and pain. He freezes each area as he moves around the face and neck. It’s really incredible. The Simoni Lift is a minor, one-hour to a 90-minute procedure with long lasting natural results. He designed it to improve sagging jowls, cheeks, loose neck and facial skin without the need for major anesthesia. Recovery is quicker and so much more comfortable than with a traditional facelift. Using local anesthesia, the only thing you feel is an injection, because each section is frozen. The procedure is not done in an operating room, but a regular nicely decorated the office with relaxing music playing. All throughout the procedure, the doctor is speaking to you normally! There is less bruising and there is no danger going under. It’s truly unbelievable and his touch is so on the mark, the faces are perfect, no stretching, and no pulled back look. Everyone looks like themselves just younger and well rested. Simoni also performs liposuction, tummy tucks and eyelid surgery like this, without anesthetic. His work is artwork. The results of Super Glue Face Lift are positively life altering. People look exactly like themselves but completely rested and vibrant, plus 10 or more years younger. This is the kind of facelift you want. It’s definitely worth flying to L.A. to come in and get it done through Dr. Simoni’s “Fly In Program”. This is the way to do it: you would stay at a hotel with a loved one for a week following the procedure, then go for your follow up checkup one week later and you’re done. For those looking for a Super Glue Face Lift, Dr. Simoni is an excellent choice. He is a nationally recognized plastic surgeon with a well-deserved reputation based on hundreds of satisfied patients. Call (310) 360-1360 for a Super Glue Face Lift consultation with Dr. Simoni. If you would like to explore your options with plastic surgery, request a consultation online. Or you can call our office to schedule your appointment with Dr. Simoni.